Today I got my daily temptation alert from the Hi Pointe Drive In, one of the best and most creative burger places in St. Louis. 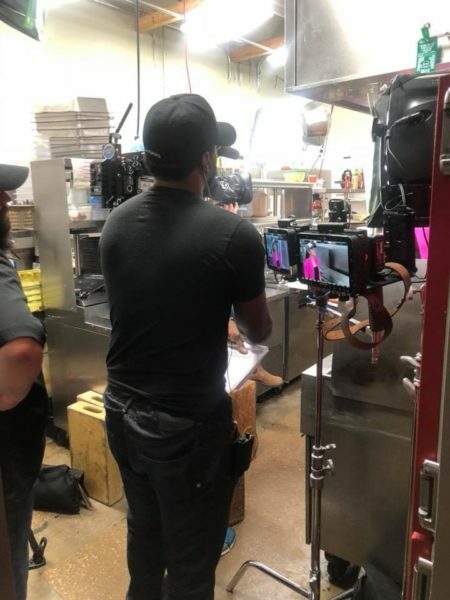 The alert was for a $5 version of their classic taco burger AND a notification that a television show (I think it was for the travel network) would be filming at the restaurant today. I was intrigued, so I convinced a friend to join me for lunch. It seemed like the restaurant was MUCH slower than usual due to the filming. I’m not exactly sure why, because the cameras were focused on the people, not the food. My friend theorized that maybe they thought a long line would look better in the background. I was amazed by the sheer number of people required to film this style of TV show. There were around 8-10 people on the crew. Only 1 of them was ever on camera. I was more self-conscious than normal while eating my burgers and conversing, just in case I was in the background of one of the shots. The table next to mine had a brief interview, so there’s probably 5 seconds of me with an entire lettuce leaf stuck to my cheek. It’s fascinating to me that a 22-minute TV show needs so much footage. I think sometimes we forget when we’re watching TV that the show we’re watching is stitched together from dozens of hours of footage cut down to maximize entertainment value. I’ve heard that when Comedians in Cars Getting Coffee is filmed, a big space is cleared around the Seinfeld table so the cameras can move around it without bumping into customers. But at the same time, my sense is that the customers in the background are a crucial part of the setting, so they need to be there (plus, a restaurant can’t just shut down for the day to serve 2 people). Have you ever been in the background while a TV show or movie was filming? What did you realize about “TV magic” from that experience. This entry was posted on Tuesday, March 27th, 2018 at 9:13 pm	and is filed under television and tagged with television. You can follow any responses to this entry through the RSS 2.0 feed. I really like that, Cara! It’s an excellent reminder to met about just how many people work on a TV show or movie. Last year, a National Geographic crew came to the Pentagon over a two-day period to cover a series of briefings by American and Allied officers. The already small conference rooms felt even more claustrophobic, when you nearly double the number of folks when you account for the sound engineers, camera and mike operators, director, et al. I’m frankly amazed at how it looks in the end when you witness the chaos around you during filming. Now that my daughter is in college, pursuing the Performing Arts, I’ve had a chance to see the magic of film production first hand in Georgia (fun fact, quickly becoming the Hollywood of the east) and it’s wild when you see more than 100 folks running around, but the focus remains on some dialogue between two people in a park. I hadn’t thought about that, Joe. On movie sets they have walls they can remove (or that were never there in the first place). But in real life–in restaurants, in the Pentagon, etc–film crews don’t have that luxury.